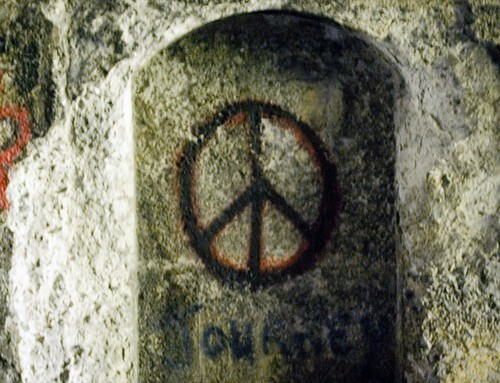 The peace symbol is one of the most widely known symbols in the world. It was created in 1958 by Gerald Holtom as a symbol for the Campaign for Nuclear Disarmament (CND). The symbol combines the semaphor (signal flag) symbols for “N” and “D” (nuclear disarmament). In the “N” the flags are held pointing diagonally toward the ground and, for the “D” one points up and one down, forming a vertical line. The symbol was used in first anti-nuclear march in London (to Aldermaston, where nuclear weapons were manufactured) in 1958. One of Martin Luther King’s associates, Bayard Rustin, attended that march and brought the symbol back to the US. It was adopted by anti-war movement and has since become a universal symbol of peace. Although specifically designed for the anti-nuclear movement it has quite deliberately never been copyrighted. No one has to pay or to seek permission before they use it. A symbol of freedom, it is free for all. This of course sometimes leads to its use, or misuse, in circumstances that CND and the peace movement find distasteful. It is also often exploited for commercial, advertising or generally fashion purposes. We can’t stop this happening and have no intention of copyrighting it. All we can do is to ask commercial users if they would like to make a donation. Any money received is used for CND’s peace education and information work.